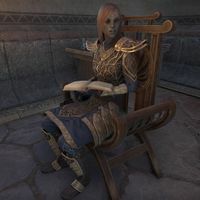 Beleru Omoril is a Dunmer who can be found at the Hall of Justice in Vivec City along with her brother, Traylan Omoril. She is the Ordinator responsible for giving out daily World Boss quests. "People hand in jobs, I hand them out. It's as easy as that." "I've never found myself in a situation I couldn't slash my way out of. Most of our jobs don't require much finesse." "Plenty of jobs coming in all the time for an adventurer such as yourself. Come and see me any time you're looking for work." I'm looking for work. Anything available? Is there a job available? I'm ready to take on a job. "Dubdil Alar has always been a bit off his rocker, even for a Telvanni wizard. Apparently now things have gotten really out of hand. His apprentice Nara Varam needs help stopping whatever he's up to. And don't bother asking me what you need to stop." "Head over to his tower and see what's going on. You've also been asked to collect any research notes you may find for the apprentice to study later. Varam can fill you in on the details. She'll also have your pay if you manage to complete the job." "Well, here's a nasty one. Ever seen a Hunger before? Looks like there's one causing trouble in Sulipund Grange. Appears to be protecting a newly discovered ruin, and some researchers need help killing it. The notice sounds quite panicked, actually." "Head to Sulipund Grange, gather some relic pieces, and try to take care of the Hunger that's protecting the area. Tirvina Avani should be in the city with more information. Nervous little thing. She'll have your pay once you're done with the task." "Dinor Salvi is having trouble over at the Missir-Didalit Egg Mine. Seems they had a recent influx of kwama coming in, and now there's far too many for the miners to handle. I heard there's a particularly nasty kwama warrior nestled up with the queen." "You just need to reset the balance. Head to the mine and kill as many kwama as you can. Don't forget to off the queen's new sweetheart as well. Salvi's in Vivec City if you have any other questions. Talk to him about payment when you're done." "Ever heard of the caldera north of Balmora? A rather nasty nix-ox has decided to nest there, and it has a craving for the strange mushrooms that grow in the ashy soil. Normally not an issue, but Bravosi Felder is attempting to research the fungus." "Just get rid of the nix-ox and collect some mushroom samples. Easy. And don't bother asking me what he's up to—Telvanni wizard nonsense of some sort. Head to the caldera and deal with it. Felder's in the city if you need more information." "Ivulen Andromo is looking for someone to help him put some ancient spirits to rest at the Salothan tomb. You up for it?" "Kill them. Again. They seem to think they're still in some old battle, their last I'd wager, and they attack anyone who approaches. Andromo may know more. He's been studying the tomb for some time now." "The Gold Coast Trading Company is looking for help retrieving some goods from a shipwreck. Sounds simple enough, but of course there's a bit more to it than that. Some type of Nereid. They pop up from time to time to lure ships off course." "Strange, I know. She's enthralled several sailors with a song enchantment, and now no one can get close to the wreck. Valga Celatus can tell you more. She posted the job and is currently in Vivec City. Head over to her and see what you can do." "I may be an expert in many things, but for this particular case I've told you all I can. Go to the person who sent in the request if you want more information." "Don't ask me, I don't have any more information on the matter." "If you're here to ask about your reward, don't bother. I just hand out requests." "Well this is odd. I could have sworn I've given you a job. Shouldn't you be off doing it?" "I'd give you a job if we had one, but we don't. Wait for a bit and something should become available." "I'll make sure you'll be the first to know if we get a new job. If you're the first to ask, that is." "Nothing's available at the moment. Come back later and I may have something for you." "A little overeager there, aren't we? Get some rest before you take on another job." This page was last modified on 18 February 2019, at 15:45.